For the month of March the Cake Slice Bakers top voted cake was the Pineapple Upside-down cake. The only time I remember having this cake was served with my school lunch at the cafeteria in grade school. This cake is better than my old Alma mater was capable of whipping up for hoards of hungry 3rd graders. The flavors are really lovely. Just imagine sweet brown sugar coated fruit with hits of buttery cake and you will get the idea. Pineapple this time of year is a cheery reminder that sunnier days are on the way. I followed the recipes EXACTLY as written. (I know I must be coming down with something!) The only ingredient swap I made was to choose a healthier locally canned cherry instead of the day-glow red variety floating around in High Fructose Syrup. The finished cake still looks pretty but the lack of dye in my cherries seemed to dull the jewel like appearance I usually associate with this cake. Flipping the cake out of the pan after cooling for 5 minutes is like waiting for the moment you get to open your birthday gifts. I was really pleased that I only lost one pineapple ring during the flip. It was easily replaced back on top of the cake. This is not a recipe I would repeat. Even though I really like the taste I found the texture offputting. The cake is gummy and soggy under the syrup and fruit. I have read that adding an extra egg white to the batter will provide a sturdier cake. 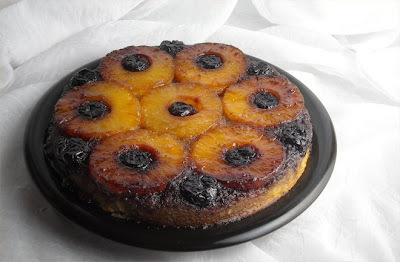 I may give Pineapple Upside- down Cake another try using the extra egg white tip. 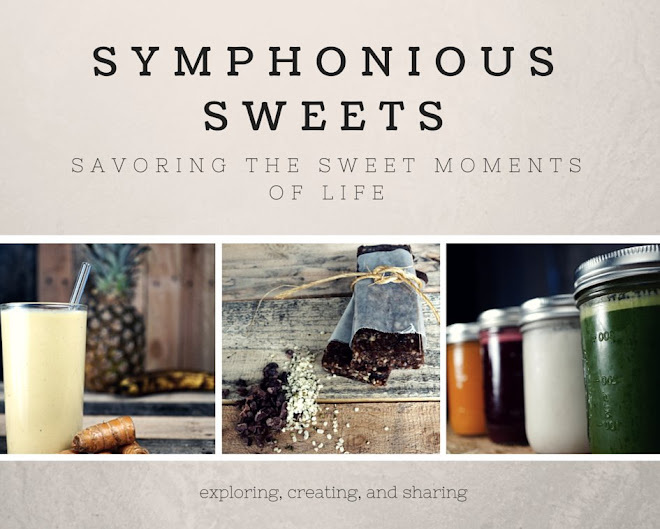 Your suggestions are welcome if you have a most favorite recipe! 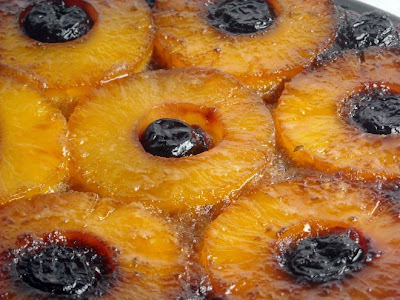 Drain the pineapple well, reserving 2 tablespoons of the juice or syrup for the cake batter. Melt the cold butter in a 10 inch cast iron skillet over medium heat. Or, put the butter in a 9inch round cake pan and put it in the oven for a few minutes as the heat melts the butter. Remove the pan from the oven or stove and sprinkle the brown sugar over the buttery surface. Place the pineapple rings carefully on top of the scattered brown sugar and melted butter, arranging them so they fit in 1 layer. (You may have a few left over). Place a cherry in the center of each ring, and set the pan aside. In a large mixing bowl, combine the flour, sugar, baking powder and salt. Use a fork to mix them together well. Add the milk and butter and beat well with a mixer, scraping down the bowl once or twice until you have a thick, fairly smooth batter, about 1 to 2 minutes. Add the egg, reserved pineapple syrup or juice and the vanilla. Beat for 2 minutes more, stopping once or twice to scrape down the sides. Carefully pour the batter over the pineapple arranged in the skillet or cake pan and use a spoon to spread it evenly to the edges of the pan. Bake for 35 to 40 minutes until the cake is golden brown and springs back when touched lightly in the center. Cool in the skillet or pan for 5 minutes on a wire rack. With oven mitts, carefully turn out the warm cake onto a serving plate by placing the plate upside down over the cake in the pan and then flipping them over together to release the cake onto the plate. Serve warm or at room temperature. Be sure to get the story from the rest of the Cake Slice Bakers. Maybe they had better luck. I too think your cake looks great with the darker cherries. I think I OD on this cake in my more formative years though to ever attempt making it myself - my Mum used to make it just about every week!!!! Your cake looks wonderful and I like the fact that you added real canned cherries. I too am with you about not repeating this recipe again. I liked the topping but not the rest of the cake. Your cake looks lovely & kudos to you for not using the dyed HFCS cherries. I agree the cake part was doughy & dense, it's weird that the butter was not creamed first. I wonder if it was, the crumb would be lighter. If you do make another pineapple upside-down cake, I recommend Thomas Keller's recipe. Thanks for visiting my blog. I'm with you on the gumminess. Not the greatest texture but I thought the flavor was good. I am curious about the technique used in this cake as well. 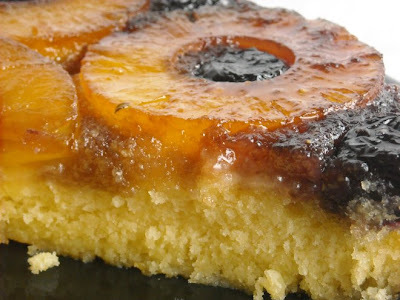 As a huge fan of the cake bible it would be interesting to see how rose has revamped Pineapple upside down cake. 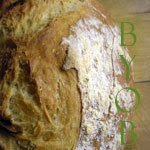 Thomas Keller's recipe sounds like it may be worth a try! Thanks for the tip! So after doing a little recipe comparisons I noticed that the recipe the cake slice group used only calls for 1/2 the amount of butter or fat of other recipes. For the cake bible recipe there is no milk and sour cream is in the formula. Rose recommends the cast iron skillet to get carmelization of the sugar and pineapple. From the looks of the tow recipes - southern cakes vs cake bible I would say they are VERY different and the cake bible version is worth trying. I love rose's sour cream cakes and the basis of her pineapple udown cake is a sourcream cake.